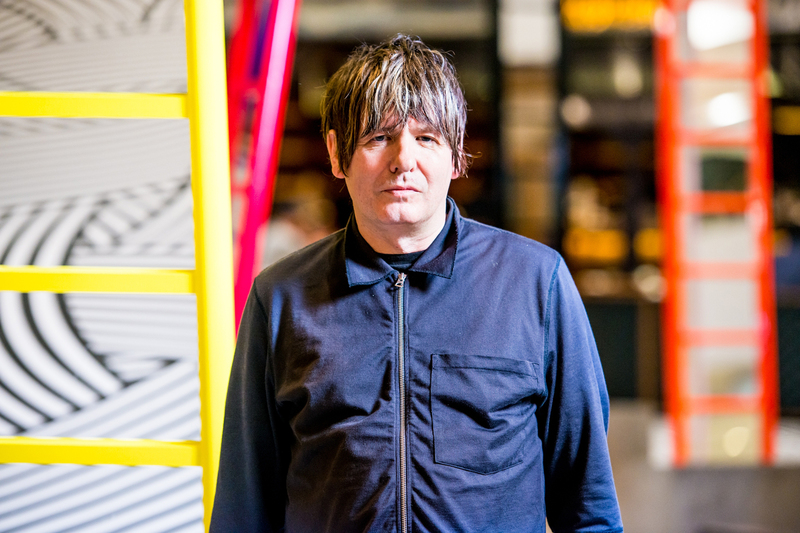 We got in touch with Jim Lambie to talk about the emergence of Asian contemporary art, his inspirations, and “Spiral Scratch”, his new site-specific work that brings together editions of two signature works, “Shaved Ice” and “The Strokes”. A contemporary visual artist who was shortlisted for the 2005 Turner Prize for his work, “Mental Oyster”, Jim Lambie is particularly known for colourful sculptural installations made from everyday materials. 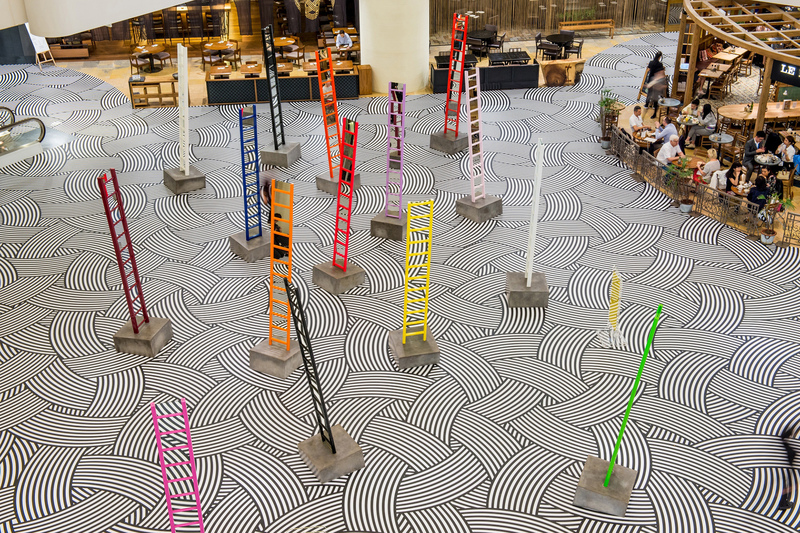 As part of the Swire Properties Arts Month Programme, which coincides with the Hong Kong Art Basel, he presented his largest installation to date at Hong Kong’s Pacific Place. How does your background in music affect your working process as a visual artist? It has very little direct bearing on my art practice. I have never started a piece of work trying to convey or explain music through it. Of course I am pleased that a sense of rhythm and beat and emotion runs through the work. And of course, things from the music world also enter the work, such as the installation at Pacific Place has the title coming from an EP vinyl record by a British band called the Buzzcocks. It is the first ever DIY, release by a band. It was self-funded, without any help from a record company. At that time this was very unique and revolutionary. The DIY nature and release of the EP was an exercise in the demystification of the record-making process. For example, its title was taken from the music being recorded literally as a spiral scratch on each side of the vinyl. Rather than suggesting an interruption of sorts, the “Spiral Scratch” on a vinyl record is a continuous flow from the outer edge to the centre. Are the colors in your work some kind of response to the grey skies of Glasgow? I wouldn’t say so directly, however I guess there may be an element of ‘making your own sunshine’ when it comes to using colour in such a predominantly grey sky ceiling. In your work, regularity and chaos coexist, how do you find the centreline of your signature? It isn’t something which I consciously follow. However, I am aware of composition and orchestration within the environmental, immersive installations I do. Therefore perhaps this balance of order and chaos is something which may come through to the viewer. Through your work, things from everyday life come back to new and different essences and meanings. What are you trying to convey in such a style? The everyday and universal objects are often overlooked and ignored. I am bringing these elements into sharp focus. Placing them in a more central role. It’s surprising how universal some objects are. A ladder for instance, a chair, a table. I always love to visit the flea markets and junk shops of a city, this is where I find the real language of the city. The ‘stuff’ people have lived with or live with on a day-to-day basis. Artists choose their development path. You were nominated for the Turner Prize in 2005. Do you believe these kinds of awards help to develop an artist’s work? How so? Not at all. Artists choose their development path. Not prizes. Only a fool would allow a prize to define them. There is a growing upheaval in Asian contemporary art, where more and more Asian artists are emerging to the world stage. How do you observe this phenomenon? It is something which I do not have much knowledge of. I believe that it is a good thing that we are seeing a more global art world emerge, and that museums and galleries around the world are introducing new work from other continents. This can only be good for those attending exhibitions. This year to Swire Properties Arts Month in Hong Kong, you brought two of your previous works “Shaved Ice” and “The Strokes” together to create “Spiral Scratch”. Why did you decide to bring this particular work to Hong Kong? The works responded to the environment. The floor piece, “The Strokes” worked well with the visual flow of people continually moving through the space. 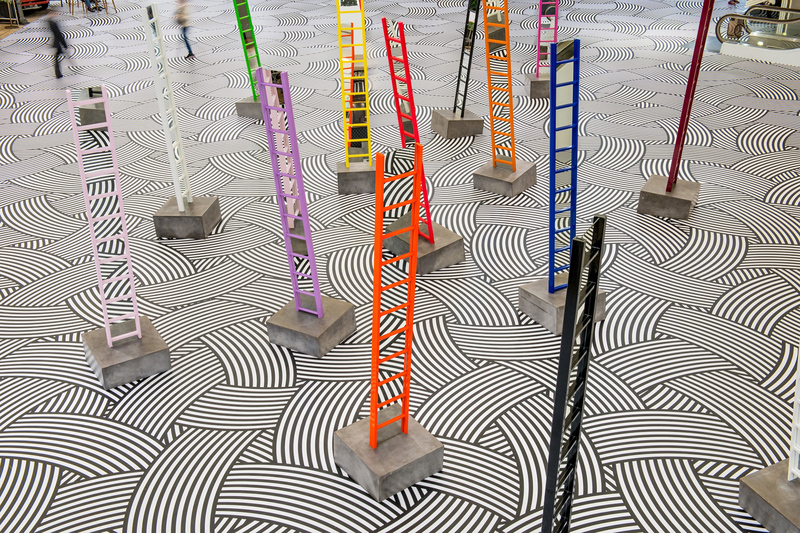 The ladders (“Shaved Ice (Reflector)”) worked with the upward movement of people as they ascended and descended through the three levels of the mall. 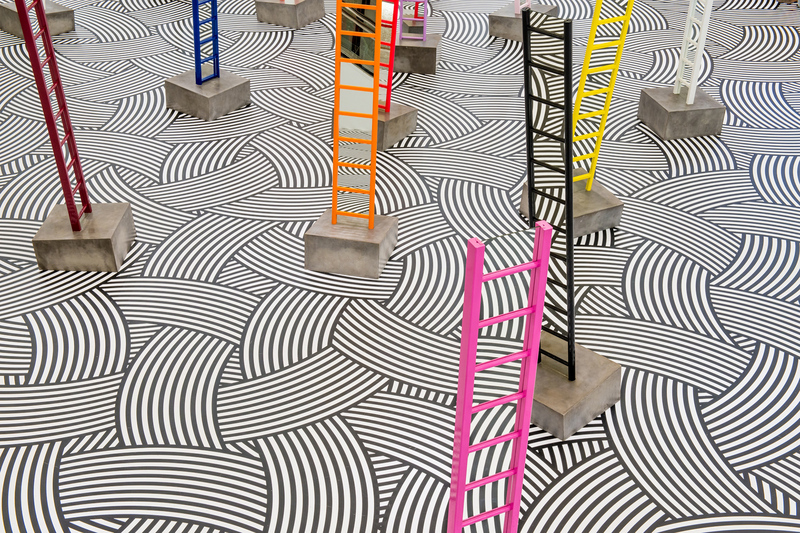 The ladders with the mirrors inserted between the rungs, allowed for new perspectives to appear, and helped the public engage more directly with the installation. The response and feedback has been pretty great. The everyday and universal objects are often overlooked and ignored. What challenges did you face with this space at Pacific Place? 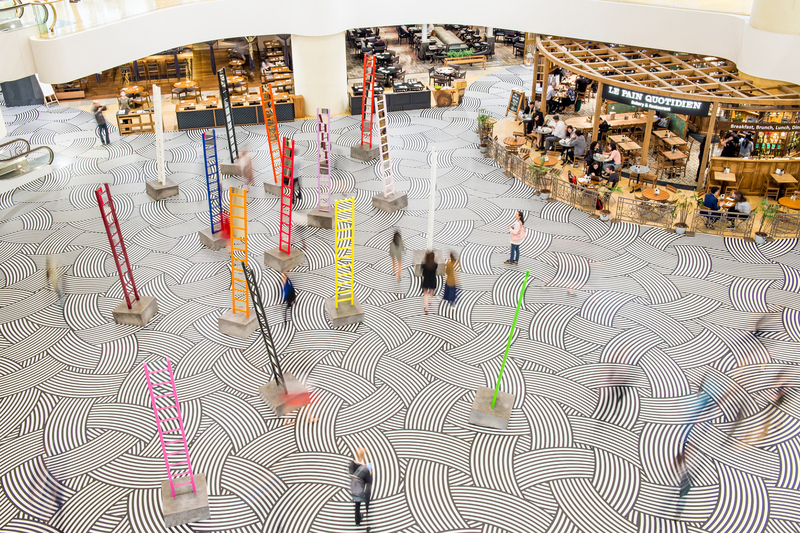 Were there any difficulties in creating this site-specific installation in the middle of the shopping centre Pacific Place? The biggest challenge was scale and accessibility. As with any public space, one has to take into consideration the day-to-day functionality of such a public space and negotiate this with as little impact on the natural flow of its daily use. We worked through the night when the mall was closed. It was an incredibly short time frame we had to install, but somehow, the team of helpers managed to do it. It was quite an achievement for such a large installation. Only a fool would allow a prize to define them. How do you hope the public will interact with “Spiral Scratch”? The installation is such an immersive experience, that it will be interesting to hear the response to the work. For the general public, I would hope that it would generate conversation. That people communicate with each other, discuss and converse. Art has this fantastic capacity to get people talking and debating their own response to the work. This can only be a good thing in my view. How do you interpret and build relationships with exhibition spaces, since most of your work is site-specific and feels like inseparable from the exhibition hall itself? There are many overlaps which allow the work to sit comfortably within the space, while also creating new perspectives for the public to engage in varied and hopefully exciting ways. Online footage shows clearly how the public has responded in many positive ways. Some doing yoga and some even breaking into to dance. It’s more than I could have imagined, and is pleasing to see such a positive response. What projects do you have planned for later this year? I have just installed a solo show of new work at Konrad Fischer gallery in Dusseldorf. In May I will have a solo exhibition with Franco Noero Gallery in Turin, Italy. And I will have work represented at Art Basel in June.